Ruger's LCR: The Best Pocket Pistol Ever? Ruger's new for 2009 Lightweight Compact Revolver, has been billed as the Evolution of the Revolver. It has proved to be at least that, if not more. Weighing in at roughly three quarters of a pound, it is hard not to notice how light this wheelgun is for a .38 Special +P revolver and how well it fits the hand. The barrel is only 1-7/8 in. long, the 5-shot revolver itself 1-1/4 inches wide. This is essentially the J frame genre of compact revolver, a bit lighter and less costly than the comparatively clunky S & W 642 series and the many preexisting variants of the platform including the S & W Model 438 Bodyguard. What quickly and dramatically sets the Ruger LCR apart from and ahead of the many old 5-shot double action compact .38 Specials is the wondrous double-action trigger pull. While the trigger gauge shows it as about a nine pound trigger, Ruger has refined the trigger geometry and spring rates so it feels much, much lighter. Double-action firing of this revolver is effortless, with a very smooth and consistent trigger pull that it is just no problem to cycle the cylinder and fire this pistol while maintaining a constant sight picture. As that is the whole idea with a personal defense pistol, Ruger can't be commended too highly for pulling this one off. It has out-of-the box factory feel just as if it had a handgun tune by the likes of Jack Weigand, for example. The LCR is that smooth. The primary ammo used was the Stars & Stripes Custom Ammo 125 grain Speer Gold Dot combat rounds. Shooting through the CED M2 chrono screens, the 5 foot velocity ranged from 767  796 fps which is formidable, especially taking into consideration the diminutive 1-7/8 inch LCR barrel. After shooting fifty rounds of this ammo through the Ruger LCR, I can't call this revolver the ideal plinker by any means, but calling the recoil quite manageable is a fair assessment. It was surprisingly manageable considering the light weight of this handgun. For comparison, let me mention one of my least favorite type of handguns, the common .380 blowback semi-auto. Many of them are just nasty little palm-slappers, with crummy trigger pulls and an unfortunate propensity to stovepipe. Often you'll find them with merciless hard plastic crucifix type grips, with slides that find new ways to slice the top of your hand as well. It's not true of all .380s, to be sure, but palm-slapping, hand-slicing stove-piping little monsters with snag-o-matic external hammers are something I genuinely revile. It is the exact opposite of what I'd want to rely on in a high-stress, self-defense situation. In fact, the only .380 that I personally consider really fun to shoot for extended periods is a Makarov IJ-70 9x17 with even the IJ-70 wearing a set of of Pearce grips. The .380 genre of pistol, even with good ammo like Gold Dot rounds, suffers in the penetration department as a self-defense round compared to the .38 Special as you might expect when comparing the sectional densities of a 90  95 grain bullet to a 125 grain bullet in about the same caliber, in this case, about .35 caliber. The benefits of a wheelgun for personal defense are straightforward: stovepiping is not a possibility and cycling past a dead round is instant. Anything that is tethered to the function of the ammo to work is going to be less reliable than the action that is not. Setting up at 10 yards, I emptied the LCR as fast as I could into the Shoot-N-C target shown at the top of the page. The results were more than adequate to neutralize most intimate threats, in my view, with actual use likely to be at half that distance, or less. Published studies vary a bit, but most self-defense applications are measured in feet, not yards. A friend of mine likes to put it this way, If I was purposely going to a gunfight, I'd use something else. So would I, as a matter of fact. But that isn't the point. We aren't going to gunfights, we simply want the ability to defend ourselves and our families should we be unexpectedly forced to do so. In this regard, the Ruger LCR shines. It is easily carried, swift to deploy, manageable in recoil allowing for confident initial shot and follow-up shot placement, is clearly a well-built, and fundamentally reliable protection piece. For in the home only defense, certainly a 12 gauge pump like the current Ithaca Model 37 Home Defense gun with a 20 inch barrel and a moderate load of #1 or #0 buck could be considered a more forgiving, effective approach. When concealability and portability are paramount, the only form of self-defense that matters is the one you have access to at that precise moment. The LCR is available with laser grips, but the approach I prefer has just been announced by XS Sight Systems for 2010, an improved standard dot Tritium front sight for the Ruger Part Number: RP-0008N-4. I'll get one installed as soon as I can, and report back on the difference it makes. 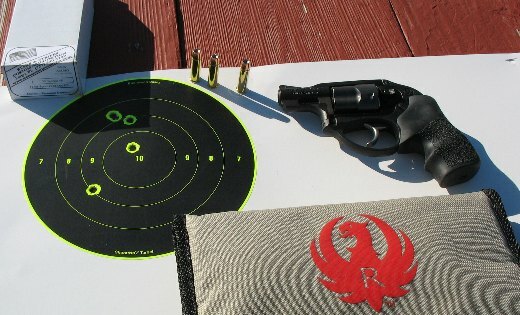 The Ruger LCR is a rare revolver, one that is optimized for a specific application, and fulfills the fast handling, ease of use, speed of use, outstanding build quality with a double-action trigger pull that has never before been approached, much less equaled, in this personal self-defense platform. It is a home-run for Ruger, and a winner in this category of this revolver with no question in my mind. Ruger has extended and improved the breed with their LCR .38 Special +P.